If you are unfamiliar with angularJS, please take the time to look at some tutorials online. There are several. Here is one. This tutorial also assumes you have an instance of Content Server with Web Reports enabled, as well as administrator privileges on a running OpenText AppWorks Gateway, with the reverse proxy service installed and configured to point to your Content Server instance. The Content Server and Gateway need not be running on the same machine but it can make some things easier if they are. In order to get started, clone the skeleton repository from git or download it as a zip. Our angular app will be composed of a single directive and a service. The directive will manage all user input – it will bind the user's tap to a function that opens the camera and allows a user to take a photo or select a photo from a list of photos. 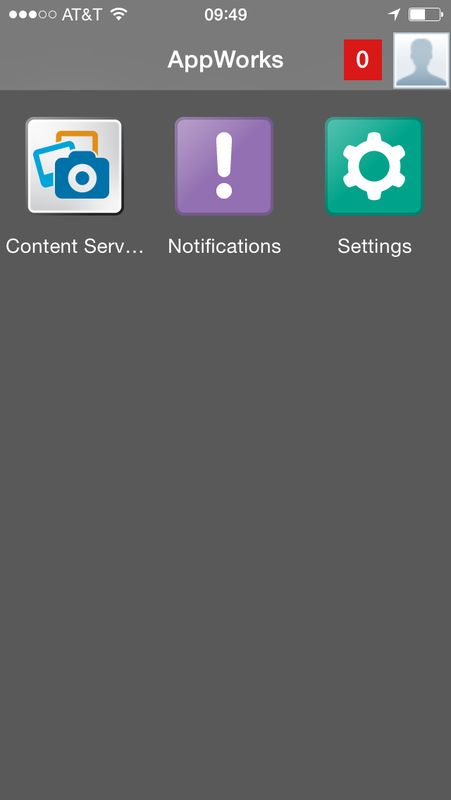 The service will take that image and send it to Content Server. In the case of this tutorial, Content Server will process the request and start a Web Report, but the possibiilites you have with it are endless. Finally, our angular service will send the response it receives from Content Server back to the directive, which will display a success message, letting the user know that a Web Report was started successfully. A directive in angular is a way to give functionality to a particular element on a page. Think of writing a function for an element with a certain id in jquery; the concept here is similar, only there are no id's or class names you need to remember, and the power and flexibility achieved through a directive are far superior to what you can get with a jquery function alone. There are three ways to create a directive: add it as a class, as an html attribute, or as an html element. In this tutorial, we will add it is an attribute on a div element. Here is our directive. 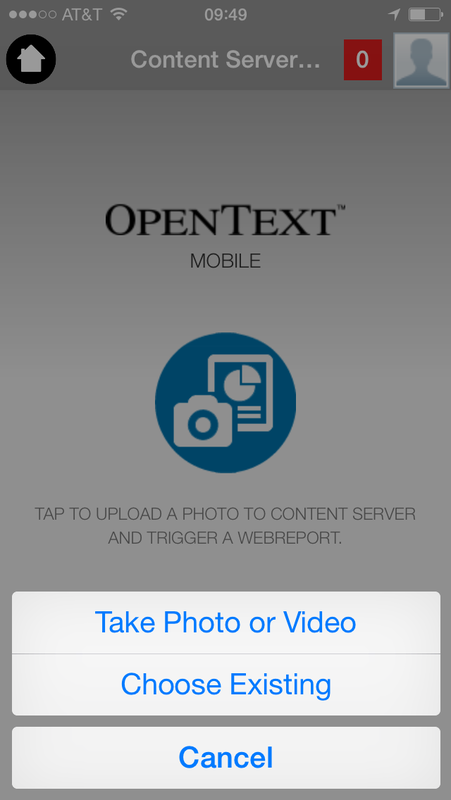 Tap to upload a photo to Content Server and create a Web Report. All of our application logic will reside in a single file – app.js. Here we will configure authentication, utilizing the otagtoken in our request headers, we will define our directive, and we will create a service to interface with our Content Server backend. To begin, lets get started with authentication. 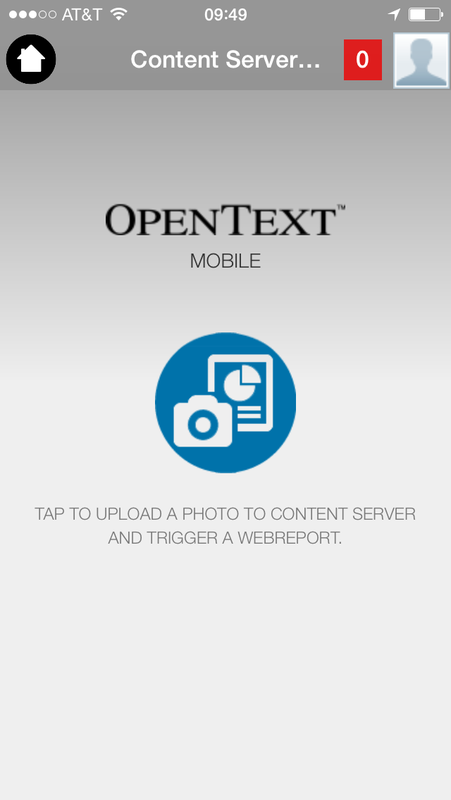 As with any OpenText product, security is a high priority for Content Server and AppWorks. As such, we will need to run some configuration before we can do anything useful with our app, otherwise we will get 401 unauthorized or 403 forbidden errors. To begin, check out the code below. The first thing we are doing is, we are grabbing the url of our gateway and attaching it to the root scope. This is so this app can be deployed on any gateway. Second, we are checking for the otag object and grabbing the otagtoken from it, then configuring the $http object to include it as a default header. Now the header of every request that goes out will include this token as a value. If there is no otag object bound to the $window's scope, then we fallback to the cookie. This is typically reserved for running AppWorks apps on the browser. Note: “run” blocks in angular are run before an application is initialized. We do our configuration inside of this block so we can be sure that our app is properly configured before we try to do anything that requires said configuration. The next piece we will crank out is the directive. Our directive will do several things. First, it will attach a hidden file input element to the DOM element we define in our directive. This file input element will do the magic of opening up the camera or photo gallery so the user can select a photo to upload. Secondly, we will want to show the user some helpful messages indicating what is going on while their request is going through the various stages it can go through. We will define a variable to hold the image source of whatever image is appended to the directive element and a spinner to replace it while the app is busy. Furthermore, we will add a text element to indicate whether the request went through successfully. The code is below. I will go through each block individually and explain what is going on. Note: In case you get confused, the format I will follow is I will display the block of code, and then I will describe what that block is doing directly below it. *  - open the input for the user to select a file. *  - if error, explain why the error occurred. At the top we register a directive named 'csFileUpload' with angular. The restrict option is set to 'A' for attribute. Angular will now search the DOM for a hyphen delimited attribute of the same name, aptly called 'cs-file-upload'. Then, we define a 'link' property for this directive; we will not need a controller, template or any other directive option. Let's get into the link function examine the first block. Here, we create a file element (var input), we search for an image attached as a child of the directive element, and we pull the 'src' field from that image. This is so later we can replace the 'src' attribute with the url of a spinner while the app is loading a request, and change it back to whatever it is originally when the response is received. With this block, we are taking the user's tap input, (effectively a click) and we are triggering a jQuery click() action on the input element we defined earlier. This will open up the camera or photo gallery. Pretty simple. This block of code is where the magic happens for this directive. When we triggered the 'click()' function earlier we opened up the camera for the user. This 'change' function will get fired when the user has actually selected a photo. The first thing we do is we take the file from the input element. 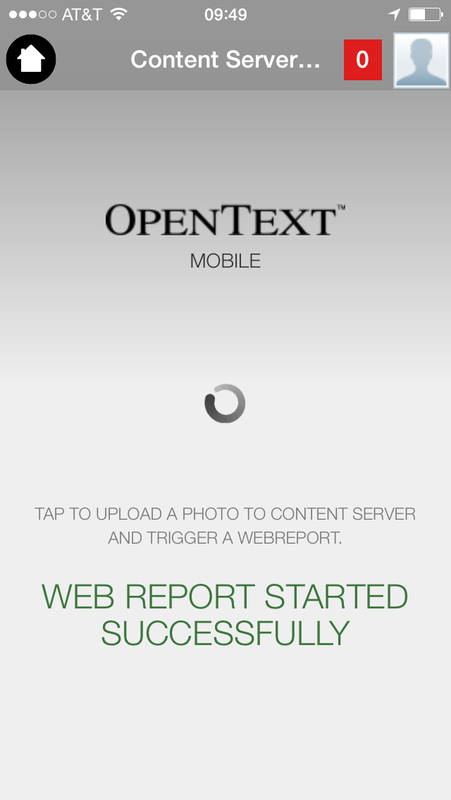 Then we create an element that will display the text “Web Report started successfully” when the response is received. After this, we have a function that will remove the text element we created above and replace the spinner back to its original image. This won't be called yet. The next line replaces the image with that of a spinner. The line after this is where we invoke our service (which we have yet to create) to upload the file to Content Server. The service function will return a promise, so we use '.success' to append the text element we created above (the one that says “Web Report started successfully”), and call the reset() function we defined earlier after a 3 second timeout. To recap what this is doing: user selects a photo –> spinner gets displayed –> image gets uploaded –> success message displayed –> three seconds pass by –> success message and spinner are removed –> file input is cleared for another file. If the server happens to return an error, we display the error message returned by the server in lieu of the success message we predefined. The reset occurs after three seconds as in the previous case. This block is purely aesthetic. It takes a touchstart event and changes the background color. It takes a touchend event and removes the background color by setting it to transparent. This is only to give the user some feedback when they are tapping the icon, and to showcase some of the cool things you can do with angular with relatively little effort. That is the directive. It is fairly straightforward, and I think those with a jQuery background will feel right at home with the code here. Next up is the service. Our service will do most of the heavy lifting for our app. It is what will process the file, create the proper form parameters and finally, send the file to Content Server. The code is below. * image.jpg when added from ios devices. There are several pieces so we will go through each section piece by piece. In this block, we define our Content Server specific detaiils. We add in the id of the folder we will be uploading files to as 'parent_id', as well as the type of file we will be uploading (144 for document), and a generic description. This solution will work for a static Content Server folder. However, if the folder you will be uploading files to is dynamic, then you will have to come up with a different solution. This block simply takes the current time and generates a unique hash. This is done to preserve uniqueness in filenames when uploading photos from a device to Content Server. Every photo taken on an iOS device is named “image.jpg”, and as you may know, Content Server does not allow duplicate entries with the same name. As such, we will invoke this function before uploading the photo. This block is the only part of the service that is exposed. Any controller that this service is injected into will only be able to call uploadFileAndInitiateWebReport. Everything we have done up to this point has been a helper method for this. Note: $http calls in angular always return promises. By returning the $http call, we are effectively returning a promise. This means that the function this promise is returned to can listen for the success event and do the appropriate thing there. This keeps this service generic enough to use anywhere uploading a file to content server is required. Dive Deeper: If you are wondering why we have set the Content Type to undefined, it is because rather than trying to figure out the content type for any file that comes in, we can let angular figure it out for us. This is accomplished by setting Content Type to undefined and transforming the request. Angular will take the file and automatically add the proper value in the header. We have gone through the steps required to build a simple AppWorks app from scratch using the angularjs framework. To recap, we have created a directive that takes the user's tap and allows her to select a photo. That directive displays a spinner while a request is loading, and a success message when the response is received. That directive also calls a service method which uploads a file to Content Server. This brings us to the service. We have written a service that creates a form object from a file, creates a unique filename based on the current time, and sends the file to Content Server. This service acts as a blackbox for any other object wishing to upload a file to content server; as such, we use it in our directive to upload files the directive pulls from the user to Content Server. If you have any questions, please drop a line in the AppWorks Developer Q&A forum.